The gap between Connor McDavid and Jack Eichel, first and second respectively on NHL Central Scouting's final ranking of the top North American skaters eligible for the 2015 NHL Draft, is slim. It's the gap between the projected top two picks of the 2015 draft, which will be held at BB&T Center in Sunrise, Fla., on June 26-27, and the rest of the field that is a bit wider. McDavid and Eichel have been touted as generational talents for the success and promise they've displayed. Each offers a different skill set that many project will mesh with today's NHL game. For McDavid, the expected No. 1 pick of the draft, comparisons have been made to Pittsburgh Penguins center Sidney Crosby because of McDavid's ability to do everything not only incredibly well, but also incredibly fast. "He's a craftsman with the puck," said Dan Marr, director of NHL Central Scouting. "His hockey sense, with his vision, his anticipation, his sense of timing and the ability to do those things at a top-end speed, you're looking at the best skilled player in the draft." In the pro-agility test at the 2015 NHL Scouting Combine, McDavid tested faster than the average prospect, especially when moving to his left, his strong side as a left-handed shot. McDavid's average time (4.4 seconds) was nine percent faster than the combine average (4.8 seconds). It's McDavid's ability to maintain that elite speed while using his elite skill that draws comparisons to Crosby. "Sidney had a lot more lower-body power in his game at 17," NHL Network Analyst Craig Button said. "Connor skates by people, and you can't look at the game in the prism of 2005 because with the obstruction, inference and holding back then, that was something Sidney really had to work through in a big way. "They are both good at adapting on the fly while skating at top speed, and that is very rare." 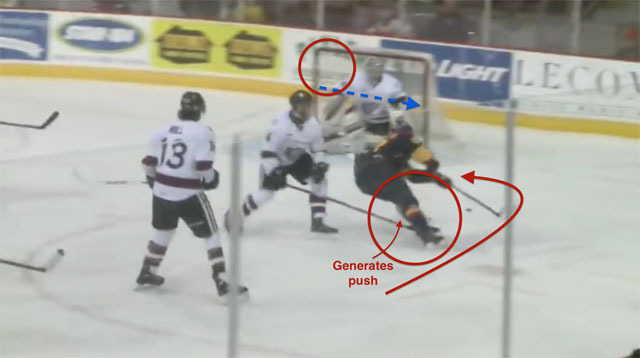 On this goal McDavid scored for the Erie Otters of the Ontario Hockey League this season, he collects the puck behind his own goal before going end to end, knifing through nearly the entire Guelph Storm. McDavid collects the puck behind his own goal and begins to pick up speed. The first Guelph skater is shading toward the wall, funneling McDavid toward the middle of the ice where there should be more traffic. But where the Guelph skater is supposed to serve as a speed bump, McDavid gets excellent push off his right leg to explode into the open space. 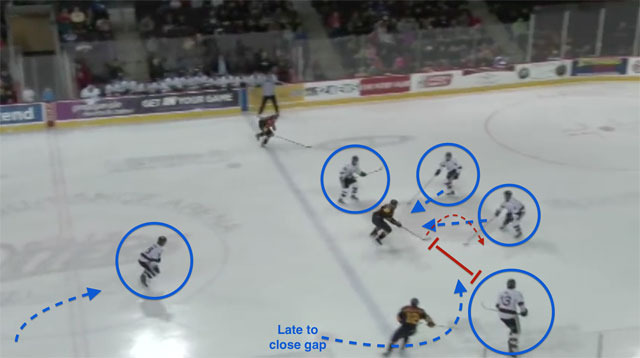 As McDavid carries the puck over the blue line, he has four Guelph skaters focusing on him. The defender in the bottom of the frame, closest to the boards, was supposed to have met McDavid above the blue line to disrupt a controlled zone entry, but McDavid was too quick through the neutral zone, throwing the spacing out of whack. What McDavid does is fake that he's going to try to shoot the gap by moving the puck toward the middle, causing the defense to collapse. 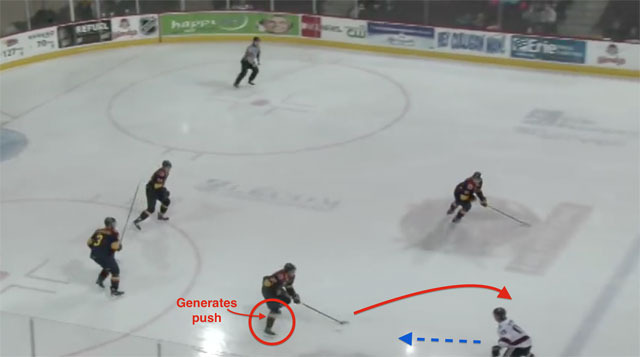 He creates space to his right, and an area he can throw the puck for a self-pass. McDavid uses his body to shield the puck from the defenseman. With no angle to shoot, McDavid gets the goalie to drift from right to left. McDavid again uses his right leg to generate power and swing back to his left, to his forehand, to create a shooting angle to go back across the grain. Jack Eichel is 6-foot-2, with an identical wingspan, but he plays like he has arms that are much longer. "I haven't seen a player at that level with a reach and a stick like that since Mario [Lemieux]," Eddie Olczyk said after coaching Eichel in September. "When he skates up into the play and into the zone, with one hand on his stick, spreading his arms, showing that arm length with the stick flailing, it's like a 747 going up ice, and I'm not kidding." Eichel maintains puck possession by angling his body into would-be defensemen and fully extending his arms and stick to create separation. 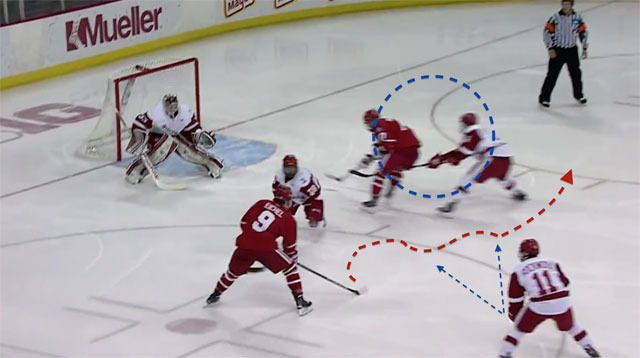 On this goal against the University of Wisconsin, Eichel uses every inch of his reach to stay on the puck and create more space for a larger shooting angle and area. Wisconsin is in a good position to defend this play. 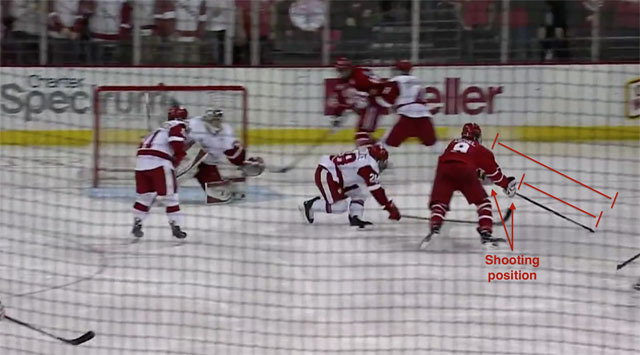 The closest defender to Eichel is playing the pass and conceding an outside shot. With a 1-on-1 on the far side, the trailing Wisconsin skater is responsible for pinching down should Eichel try to move through the slot. As Eichel cuts in, he begins to extend his hands and move through the circle. 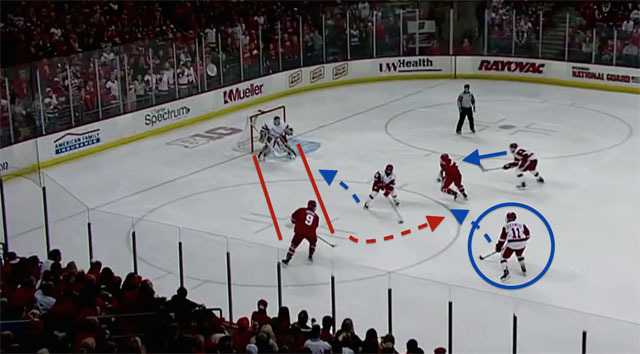 With a few quick stickhandling moves, he buys himself enough space to keep each Wisconsin skater at a safe distance. Now in a 1-on-1, Eichel fully extends his arms and his stick, keeping his hands in a shooting position. Not only does this create separation from the defender, but by holding the puck farther back, it gives Eichel more to shoot at with the Wisconsin goalie on top of his crease. These attributes -- McDavid's ability to execute at top speed and Eichel's to use every inch of his reach -- are ones each will lean on in his rookie season. They're intangibles that put McDavid and Eichel into the upper echelon and separate them from the rest of the draft-eligible prospects.